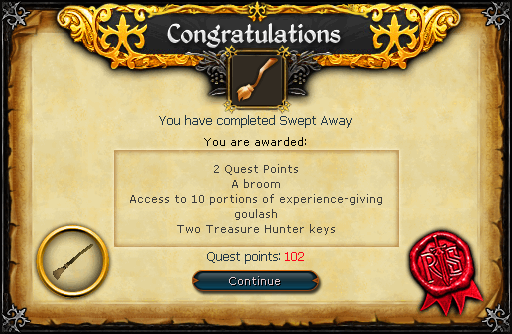 Swept Away was released alongside the Halloween 2008 event. Maggie the traveling witch is brewing up a new potion, but she needs some help to complete the recipe. Stew up some enchantments and help Maggie complete her secret potion in this puzzling quest full of delicious surprises! Begin by speaking to Maggie who can be found south of Draynor Village. 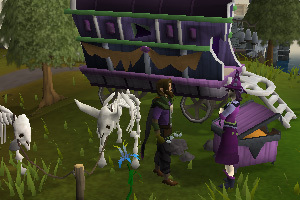 To begin this "goulash" Quest, speak to Maggie who can be found south of Draynor Village in her traveling encampment. Maggie explains to you that she has been concocting something special in her cauldron and must finish it by stirring with an enchanted broomstick but her mighty ox, Babe, has fallen ill and she must take care of him! Being the brave adventurer you are, accept your quest to ask Hetty, Betty, and Aggie to help you fully enchant the Broomstick that Maggie gives you. First, you must speak to Hetty who can be found in Rimmington. Hetty, being the kind witch she is, agrees to help start off the enchantment with some broom ointment. To make this special ointment she will need a live newt, which just so happened to come in a fresh shipment! You will be asked to go down into the delivery room to retrieve a newt for the ointment. Open and Climb down the ladder just south of Hetty's house, you will be in a rather ordinary storage room. Talk to Gus the delivery ghoul, who can be found wandering around the room looking very confused and sad. He explains that he has completely mixed up every label on the crates, not one of them is labeled correctly! What he does know for sure though: one of the crates contains newts, another one holds toads, and the remaining crate holds a mix of both newts and toads. Gus will give you three labels to place when you have figured out what creature is in each crate. To figure this puzzle you must remember that every crate is labeled wrong, and since you are only allowed to choose a sample from one crate you should extract a creature from the incorrectly labeled 'Newt and Toad' mixture. If you extract a newt from the mixture crate, place a newt label on that crate. If you extract a toad from the mixture, put a toad label on that crate. After you have finished labeling the mixture crate, find the incorrectly labeled crate of either the creature you extracted from the mixture crate and put the other single creature label on it (Not the mixture one!). The final crate is obvious, you should put the toad and newt mixture label on it. Take a newt from the now correctly labeled crate and continue up the ladder back to Hetty's house. Receive the broom ointment from Hetty and use it on your broomstick to finish the first part of the enchantment. 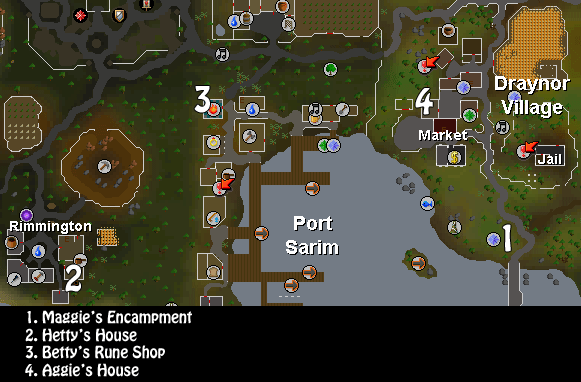 Travel north east to Port Sarim and go to Betty's Rune Shop which is the north westernmost building. Explain to her that Maggie needs her broom enchanted; Betty says she would be happy to help and explains that she needs her wand for the enchantment. To retrieve Betty's wand, Open and Climb down the trapdoor in the south east corner of the rune shop. Once down the ladder speak to Lottie, ask her about retrieving Betty's wand. Lottie explains that Betty has intricately locked her wand in the chest. The only way to open the chest is to restore order to Betty's collection of animals. Each creature needs to be placed in its proper cage in order for the chest to open, but there are further complications. First you cannot carry more than one creature at a time. Second, none of the animals can be carried through the door of a chamber that contains another creature in an enclosure. 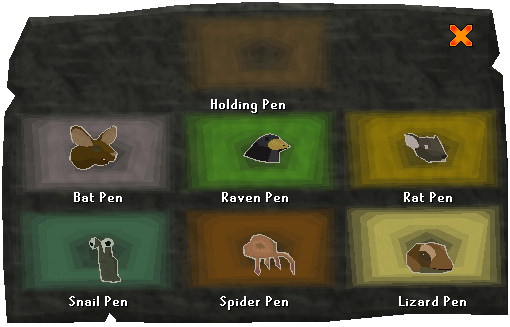 You will be given a Magic slate that can be used to view the order of the creatures at any time. Everything is now in order, good job! Go back to the locked chest; you should now be able to open it! After searching the chest for Betty's wand, go back up the ladder and talk to Betty. She will enchant the broom with her wand, terminating this part of your enchantment. Now, travel east to Draynor Village and Aggie's house in order to speak to Aggie. She will gladly help, but explains that space and privacy is needed. She will tell you about a special grove that Witches often use for enchantments and offers to teleport you there if you help her clean it up. Accept, and you will be whisked away to a magical forest area. 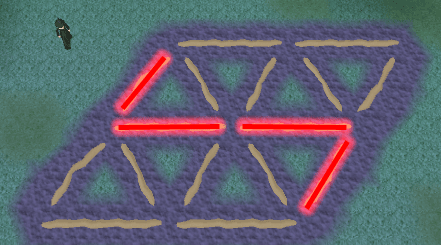 In the middle of this area is a large magical symbol covered with lines of sand. Aggie explains that for the enchantment to work you are only allowed to sweep away 4 of the 16 lines to leave 4 small triangles of sand. When you have swept away those four lines your character will feel a pizazz sensation through his whole body, even down to his pixelated toes! Talk to Aggie again or teleport out so that you can return to Maggie with the fully enchanted Broomstick. Pleased, Maggie gives you the honor of stirring the cauldron with the Broomstick. You can stir it by either using the Broomstick with Maggie's cauldron or selecting the "Stir" option. Maggie will then offer you a taste of the spicy Goulash for your hard work, and to think it was a magical witchly potion! A broomstick: Should you ever lose it speak to Wendy were Maggie was originally located. 10 portions of experience-giving Goulash. 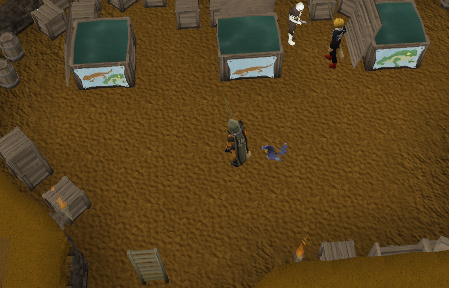 Ability to have a purple pet cat after completion of the Purple Cat miniquest. Ability to have your Broomstick enchanted after completion of the Broomstick Enchantment miniquest. Talk to Aggie after the quest to receive a bowl of Goulash. This bowl contains ten servings, and each serving will grant you experience (based on your current level) in a skill of your choice. [^] Go back to Maggie to complete the quest!